Last week, I did a Drugstore Make Up Picks so I thought I'd do a more mid to high end picks too. Some of the categories aren't aligned across the two posts as some products I only buy from the drugstore (e.g powder) and conversely, there's some I only buy from more high end retailers. I swear by this primer, not only does it reduce the visibility of pores, it also helps make up stay in place all day. I bought this foundation a few months ago and have absolutely fallen in love with it, you can read my full review here, but in short, it's so easy to apply, is high coverage without feeling heavy on the skin and lasts all day. This is a relatively new purchase of mine, but I've been absolutely loving it. It's such a high coverage and is so easy to blend, plus it smells incredible! Again, this is quite a new purchase for me, but I've already fallen in love. It's so pigmented and is such a beautiful colour, what's not to love! This is actually my everyday blusher as I love it so much. It's not very pigmented, but I prefer this for an everyday blush as it adds a natural tint to my cheeks. I use this on a daily basis too. It's such a beautiful highlight and I do find this very pigmented, I only need a tiny amount to give my cheekbones a natural glow. I have fallen in love with this product. Previously, MAC were my go to, high end mascaras, but since trying this, I've totally been converted. It volumises and lifts my lashes like nothing I've ever tried before. I love both the 'Smolder' (black) and 'Teddy' (brown) shades in these pencils. I tend to use the 'Smolder' in my waterline for nights out / special occasions. Whereas, I use 'Teddy' on my upper lid during the day, particularly in the summer. Of all the Naked palettes (and high end eyeshadows) the Naked palette is definitely my favourite and I find myself reaching for it the most. I think it's because the shade range is much more suited to my skin tone, than any of the other palettes I own. As with all Urban Decay eye shadows they're so pigmented and easy to blend, plus they're so long lasting. I love this primer. I used to use 'Original', but I recently tried 'Eden' and loved it so went out and bought the full sized tube. I've never known an eyeshadow primer to keep my make up in place as well as this product, it's incredible! Being quite fair, I have to be careful with my brows as I don't want to apply loads of product and then make them look very unnatural, so I like to use an eyeshadow with an angled brush, just to help fill them in. I've been using Omega from MAC for a few years now and it does the job perfectly. I love the lipsticks from MAC, they're so pigmented and long lasting. As an everyday lipstick, my favourite has to be 'Angel' as its a subtle pink tone, that suits any make up look. The Lip Liners from MAC are so easy to apply especially for a lip liner novice like me! I particularity like the Pro Longwear range as they last well all day. What are your mid - high end make up picks? 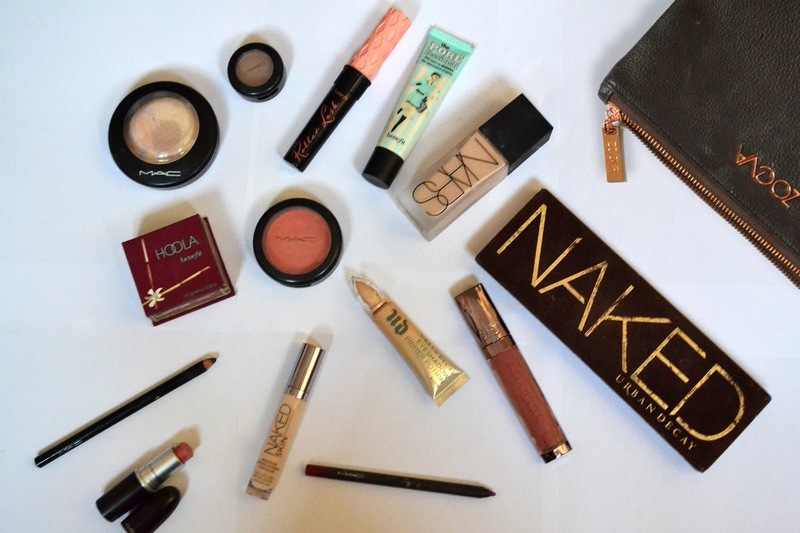 (All links in this post take you directly to the shades / colours of the products I use).